This morning was busy from 8:30. Yes, finally! 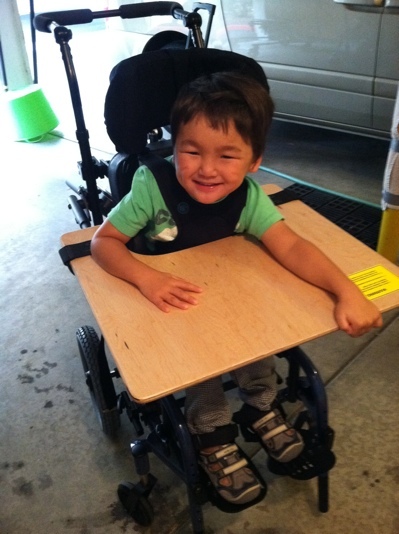 Leo's first wheelchair, gait walker, and bath chair! 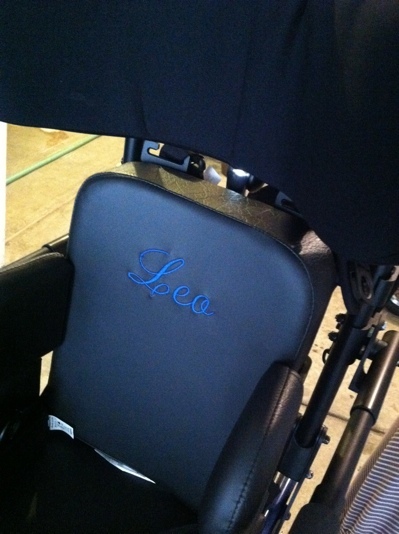 See Leo's name on the seat! Cool, isn't it? We got the equipment adjusted and also got the instructions. His body get stabilized with the belt all over his body, so he can now study, practice finger movement more, and even eat food on the table. 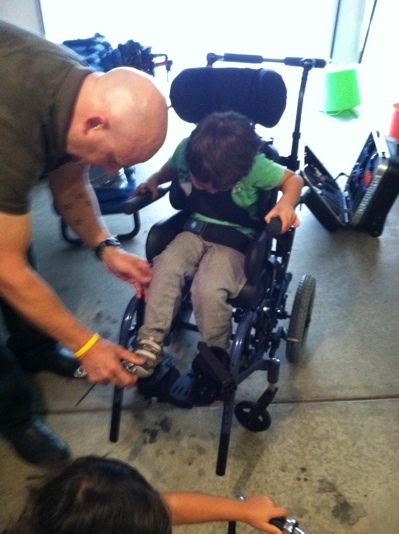 The gait trainer is one size bigger than the one we are borrowing from school. What's better with it is that it has the arm support that he can grab and stabilize the upper body more. Leo was very exited and so were we because he had never walked like this smoothly before. And this one is a bath chair. We may use it as a regular chair in the living room. Sena was in a bad mood throughout their visit. She was feeling unfair about the stuff that her brother got. So we are making up with something for her later. 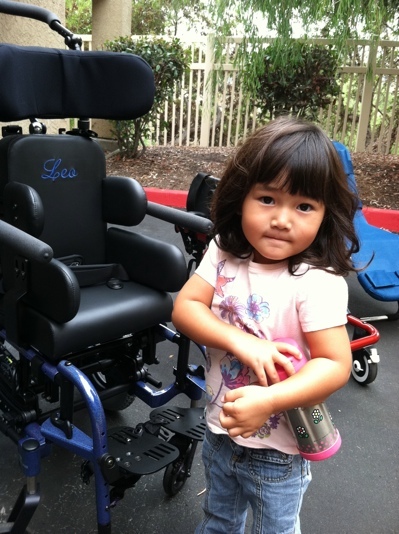 Well, we have Medi-cal cover the cost but realized again that the medical cost is very high in the states. And at the same time we realized our daily life needs to change too. It looks small but it is in fact heavy. Even I have trouble lifting it up, so no way for my wife to be able to do that. So we need a portable ramp to put it in/out of the car. Otherwise my wife and I will hurt our back, which are already problematic. 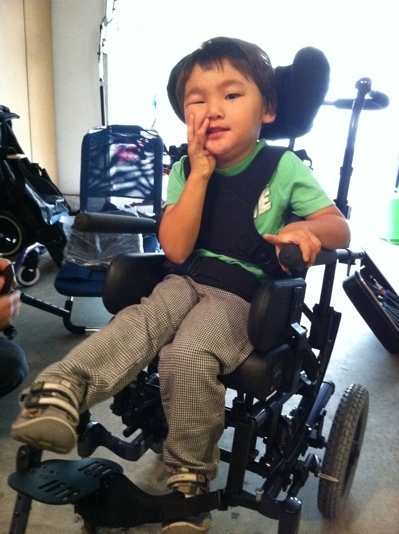 We were told at school to use the shuttle bus service once he started the wheelchair. This means that he will be in the chair all the time, which makes me feel kinda sad... (even though he is already in a special chair at school all the time). And although not in the near future, but we need to do something with the car when he becomes bigger. 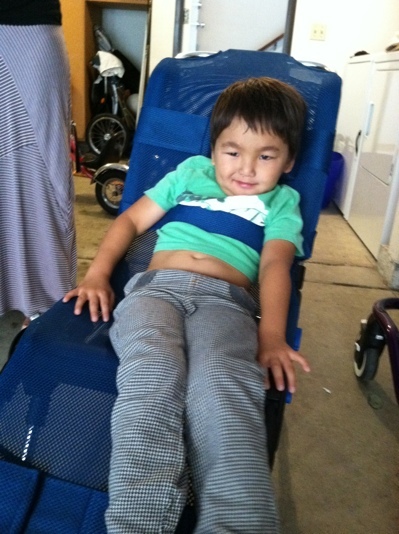 We need to get rid of the seat in the minivan so that we can move him in the char into the car. We need to think about moving to a single-story place. 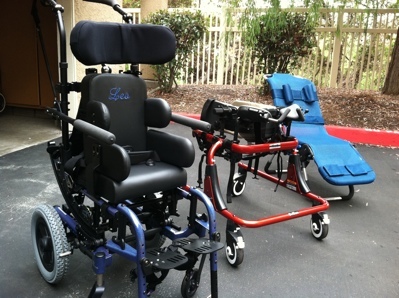 Our twonhome is not a good place for a disabled person.